Is one of the most famous waterfalls in the Philippines, the falls are over 120 meters at vertical drop spilling into the Pagsanjan River and is one of the major tourist attractions of the region. The three-drop waterfall is reached by a river trip on dugout canoe, known locally as Shooting the rapids. The most popular way of reaching the falls is through, the Shooting the rapids boat ride, two skilled boatmen takes one to three passengers on a wooden or fiberglass, long, narrow canoes to the falls, which could take more than an hour of paddling upstream depending on traffic and water level. 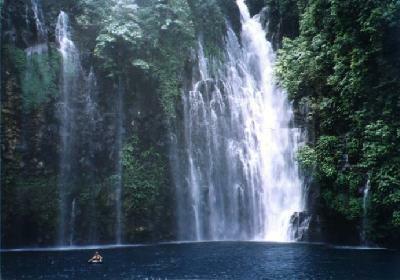 The journey takes passengers through the narrow and verdant Pagsanjan Gorge lined with huge boulders, rocks and small waterfalls. The ride upstream ends in a natural pool below the falls where an optional raft ride takes visitors through a curtain of cascading water to the Devil’s cave behind the falls. A marvellous place to visit in side the Devils Cave, The return trip called Shooting the rapids is a thrill ride through fourteen rapids as the skilled boatmen maneuvers the boat through the narrow rocks as it head downstream. 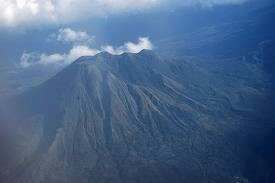 Also known as Mount Maquiling, rises 1,090 m above mean sea level, and is a potentially active volcano in Laguna province. Legends surround the mountain, many of which relate to Maria Makiling, said to be the ( Guardian fairy ) of the mountain. The contour of the mountain is said to be that of her in a reclining position. The mountain Is a very popular hiking destination. The two major trails begin at the UPLB College of Forestry and Brgy. San Miguel, Sto. Tomas, Batangas. The UPLB trail is more commonly used, taking 4–5 hours to reach the summit (Peak 2). This trail was closed in October 2007 due to trail damage wrought by Typhoon Xangsane on September 2006. The trail was closed again in December 2012 after two students were found drowned in a restricted area on the mountain. The trail was re-opened most recently in March 2013. The town of Los Banos in Laguna province is a first class urban municipality with a population of 98, 631, and is located 63 kilometers south of Metro Manila. With a total land area of 5,650 hectares, Los Baños is situated on the northern foothills of Mt. Makiling, a dormant volcano, and along the narrow shoreline of Laguna Lake. Mount Makiling looms over the town where there are five streams of water – Dampalit, Saran, Pili, Mulawin and Maiitim. It is well known among tourists for its hot spring resorts that dot the area. Los Banos also hosts the University of the Philippines, aside from its importance in academics, science and research, Los Banos is a well-known tourist destination. its hot spring resorts are frequent weekend or summer getaways for residents of the vast metropolis and tourists from other places in the Philippines and abroad. Tourists who visit Los Banos also come to the several native delicacies stores in the town to buy the town’s famous Buko pie (coconut meat pie). Another notable geological feature is Tadlac Lake, a lake whose almost perfectly round shape and uncharted waters have led some locals to call it ( the enchanted lake ). Others call it ( Alligator lake ) , a reminder that it served as the last bastion of Laguna de Bay’s once-plentiful cayman population, which has since been wiped out and is now just another legendary part of Philippine history. 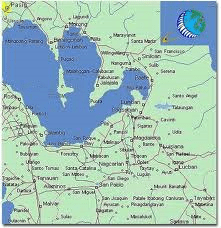 Is a fourth class municipality in the province of Laguna, with a population of 24,696. Paete lies at the foot of the Sierra Madre Mountain range on the northeast side of Laguna de Bay. This town is famous for its skilled woodcarvers and fine woodcrafts and papier mache. It is interesting to note that the modern yoyo is widely believed to be invented in Paete. On March 15, 2005, Paete was proclaimed as the “Carving Capital of the Philippines” by President Arroyo. Even now, they continue with their centuries-old tradition in carving and painting. Its statues. Many descendants have found a niche in the culinary world. Ice sculptures and fruit and vegetable carvings done by Paete’s abound on buffet tables of cruise ships and world-class hotels and restaurants. Today the town thrives mainly on the sale and export of woodcarvings and taka, tourism, poultry industry, farming and fishing. Best time to visit Paete is during the Holy Week – the people of the town re-enact the events that took place at this time. It starts on Palm Sunday when Jesus’ triumphant entry to Jerusalem is re-enacted. It ends in “salubong” on Easter Sunday, the meeting of the Risen Christ and Mary Magdalene and His disciples. Is the capital town of Laguna, It is a first class urban municipality with a total land area of 3,860 hectares. Santa Cruz’s population is 101,914. The topography of Sta. Cruz, Laguna is “characterised by fertile flat lands situated along the coastal plains of “Laguna de Bay.” As such, the livelihood of the town was traditionally dependent on the primary industries of fishing and agriculture, and remains until today. The town is known for its abundant coconut and rice harvests. It also functions as the service centre for transportation, commerce, health, education, and other social services for the predominantly rural northeastern municipalities of the province. Boosting the economy of the municipality are the incipient and fast growing agribusiness industries such as livestock raising, horticulture and aquaculture. Santa Cruz has neither natural tourist spot nor man-made attraction; however, it serves as the business and commercial hub particularly for the predominantly rural northeastern towns of the province such as Cavinti, Luisiana, Majayjay, Nagcarlan, Pakil, Pangil, Famy and Mabitac. Santa Cruz fulfills its roles as service center; health, education, transportation, commerce, and social services center for the entire province.